A child at a home daycare facility was given aspirin after falling down, but the child suffered from an aspirin allergy which triggered an asthma attack. The child’s aspirin allergy was known by his parents, but undisclosed to the facility. The facility had permission to administer the child’s inhaler in case of an asthma attack. The aspirin induced a reaction so severe the inhaler was ineffective in stopping the attack and emergency personnel were required to treat and stop the child’s allergic reaction and asthma attack. 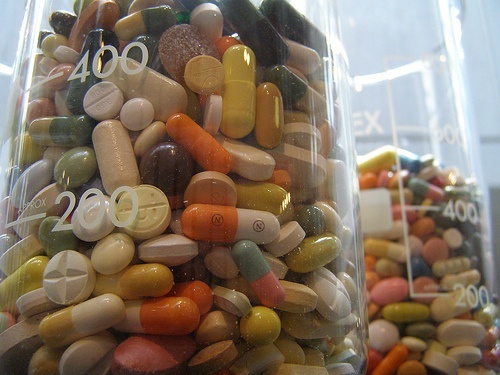 Each year more and more children are taking prescription medications in the United States. Children are prescribed medications for a wide variety of conditions including asthma, diabetes, attention deficit, psychological disorders, and many more. Attention to detail is required to ensure that medication for these conditions is given correctly. Methods of administering medication include oral, eye drops, ear drops, inhalers, and injections. As the amount of children taking medications rise, so does the number of accidents involving improper doses, mixed up prescriptions, and incorrect administration. The consequences of incorrectly administering medication can range from minor to life-threatening. No medication – including common over-the-counter medicatons – should be kept on-site for general use. Only medicine for use by a single child which was supplied by that child’s parent or guardian should be used. All medication should be clearly labeled and stored in a locked cabinet or drawer. If the medication needs to be refrigerated make sure it is kept out of reach of children and kept secure. Never give a child a medication that was prescribed for some one else. This policy applies for siblings and over-the-counter medications. Use proper measuring utensils when administering medications and make sure to thoroughly clean them after every use. Always go over medication instructions with parents before administering any medications to make sure they are administered properly. For example, some medications require being taken with meals and others are meant to be given at specific times of the day. If you have any questions or concerns consult the child’s parents, guardians, doctor, or pharmacist. If any medication requires injections make sure there is a trained professional capable of giving the medication. 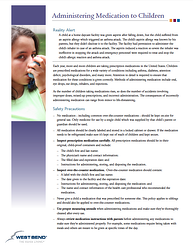 If no professional is available, inform the parents that the medication cannot be administered. Permission Form: Consent forms filled out and signed by parents detailing what specific medications can be given to children and when they can be given. Medical Information Form: Filled out by parents when children are registered for programs. They should contain all pertinent medical information, known allergies, and contacts. Also, if the child has any diagnosed allergies they should be encouraged to wear medical ID bracelets as an extra precaution.